The majority of the posts on this website pertain to private sector stores, restaurants and the like. But, there is one major project is being wrapped up by The City of Spokane to consolidate the city's large fleet of vehicles into one location and make the city a bit greener, and because of this it must be mentioned. 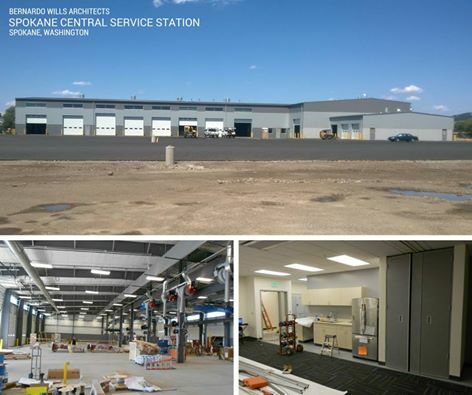 The greener aspect is because, this new " service center ", called the Spokane Central Service Center will allow the city to convert it's solid waste department vehicles over to compressed natural gas. Also, the new Service Center will provide one central location, eliminating some un-needed trips since prior to this building, the City of Spokane had 3 separate locations where it's vehicle fleet was based out of. This new building will also allow those sites to be opened up for possible redevelopment. The new Service Center will provide the city's fleet with repair, on site fueling , maintenance and vehicle washing and keep all employees together, improving communication. The City of Spokane's new Central Service Center has also acquired the nickname Nelson Service Center due to it's location at 915 N. Nelson in the Chief Garry Park neighborhood. The building has two stories and 57,500 square feet of space. Construction being done by Garco Construction and architecture design work done by Bernardo Wills Architects PC , both local businesses.